Need skip bin hire Oatley. We are your local skip bin business that has been serving Oatley and the surrounding communities since 2003. Your rubbish should be simple to deal with and easy to get rid of. Our years of experience allow us to ask you the right questions to sort out what size bin you need, where to place your bin and what is the absolute best price for your skip bin hire in Oatley. Renovation mess is easily taken care of with a skip bin on site in Oatley. Small bathroom renovations use our 3-4 metre skip bins while kitchen remodels, room additions and site clean-ups like our larger bins at 6 and 8 cubic metres. You may need a skip bin for moving house, a good spring clean or have the harder task of taking care of a deceased estate. We pride ourselves on customer service and clear communication. We will spend the time with you sharing our expertise from over 10 years in the industry to work out the best options for your skip bin hire and waste removal needs in Oatley. Perched in beautiful bushland amongst sandstone outcrops and surrounded by the Georges River in Sydney’s south Oatley is about 18km from Sydney’s centre. Oatley Public School and Oatley West Public School plays host to the many families attracted to this area. 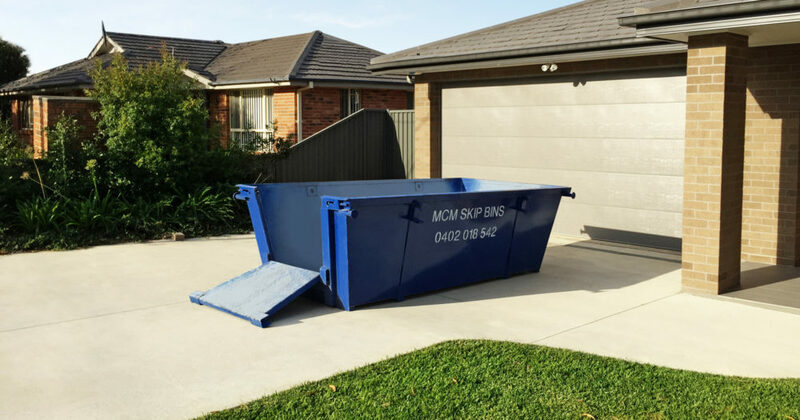 MCM Skip Bins is busy dropping off skip bins to many homes that are undertaking back yard transformations and renovations to accommodate their expanding families. Families in Oatley enjoy the spacious bushland of Oatley Park. Oatley residents are spoilt from choice with Oatley Shopping Village filled with small speciality shops, bakers, grocers, IGA and the famous Oatley Pie Shop. Oatley West also has the a shopping strip anchored by Coles but complimented by hairdressers, gift shops and Verdaflore Florist. The shopping village offers many dining choices including Edmonds and Geer Café, Italian and Thai. The addition of Bitton Gourmet adds Oatley to the list of places to be and be seen. This busy centre has seen shop fitters and builders alike that are highly valued customers of MCM Skip Bins. Our guaranteed scheduling gives project managers reliable times allowing them to keep to tight schedules allowing them to run an efficient job site. You can ask us about specific materials you may want to get rid of in the hire of your skip bin in Oatley. We do offer recycle bins for clean sandstone, brick and concrete. These bins can be offered at a discounted rate and moved quickly to allow multiple loads. Of course our FAQ page gives you lots of information about the ins and outs of hiring your skip bin.